ZooTennis: DeVine, Smith Win Wild Card Tournaments, Entry into Nationals; Paul Advances at Binghamton. Joins Bryde in ATP Event in Atlanta; Kentucky's Gomez Beats Baghdatis; Are Spain and Switzerland Heading for Men's Tennis Decline? DeVine, Smith Win Wild Card Tournaments, Entry into Nationals; Paul Advances at Binghamton. Joins Bryde in ATP Event in Atlanta; Kentucky's Gomez Beats Baghdatis; Are Spain and Switzerland Heading for Men's Tennis Decline? The inaugural USTA Wild Card tournaments for entry into the 18s Nationals were completed today in Arlington, Texas, with Jake DeVine and Maria Smith earning their places in Kalamazoo and San Diego. DeVine, the No. 2 seed, defeated unseeded Erik Kerrigan 6-2, 6-4 in the final. 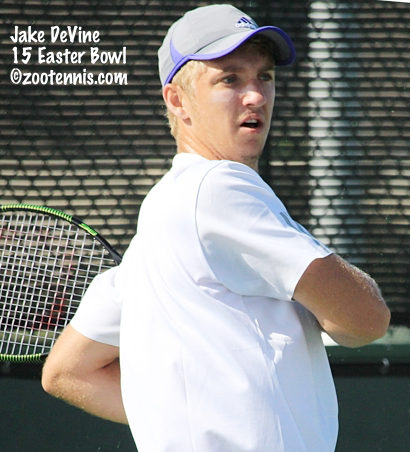 DeVine, who reached the final of the Kalamazoo 16s in 2013, losing to Tommy Paul, won all five of his matches in straight sets. Smith, also a No. 2 seed, needed only three victories to earn her wild card, with a bye and a walkover in her first two rounds. The 18-year-old from Texas beat top seed Olivia Hauger 1-6, 6-4, 7-5 in the final. Today in Binghamton, Tommy Paul joined Frances Tiafoe in the second round of the $50,000 Challenger, defeating Gonzalo Escobar of Ecuador 6-3, 7-5. Paul has received a qualifying wild card into next week's BB&T Atlanta Open, the first ATP event in the US Open Series. Fifteen-year-old Trent Bryde won a wild card challenge playoff today in Atlanta, earning a qualifying wild card with a 6-3, 6-4 win over Kyle Montrel of Xavier University of Louisiana. Tiafoe was awarded a main draw wild card into the tournament last month. At the women's $50,000 Sacramento Challenger, wild cards Brooke Austin, Jamie Loeb and Robin Anderson won their first round matches, as did Kristie Ahn and No. 5 seed Jennifer Brady. UCLA teammates Brady and Anderson will play in the second round Thursday. After Alex Sarkissian picked up his first ATP win last night in Bogota, former Kentucky star and qualifier Alejandro Gomez of Colombia came up with an even bigger victory there tonight, beating No. 5 seed Marcos Baghdatis of Cyprus 6-3, 0-6, 7-6(3). Gomez, who completed his senior year in 2014, is ranked 698, while the former Australian Open finalist is No. 45 in the ATP rankings. For more on Gomez's win, see this article from the University of Kentucky website. ESPN.com's Kamakshi Tandon looks at the men's talent pipeline in Switzerland and Spain and asks if those two countries are prepared for the seemingly inevitable decline they face as their superstars move closer to retirement. Collette, What are your thoughts on these two very generally stated perspectives:(1) Kalamazoo should have the best American 18 and under players entered no matter what- we want the best, end of story, versus: (2) the event should be what it was 20 or 30 years ago and should not have players competing who have essentially been playing (and winning on) the pro futures and challenger circuit - they are simply playing to win 4 matches so that from the quarters on they have a much easier road then playing US Open qualies. The number 10 endorsed boy from whatever section gets no joy from playing 290 in the world- it is not a "great experience" when he is trying to impress a college coach. When did Kalamazoo in it's history start awarding wild cards? Thanks Collette. Always appreciate your insight. I, for one, would put a strong vote to #1. We want the best. They are trying to win their country's junior national championship - and yes, a big carrot goes along with that in the form of the US Open Wild Card. So be it. The kid who is #10 in his section isn't being disadvantaged to have to play someone his age who just happens to have an ATP ranking. Brent- Well said. Maybe that was a bad example I used. I may have not stated it well. The ATP player who has not played a junior tourney in 12 months, does not attend school and perhaps keep money from Futures events (?- Can an 18 year old player who has accepted money above expenses for an amateur and who gets in by virtue of their ATP ranking still play? I have no idea what the rules are). Should he be in the tourney? But you stated it very well and concisely Brent- national championship and you are 18, case closed. I have no idea when Kalamazoo started awarding wild cards, but I'm with Brent. I want the best US juniors playing each other. I have no objections to pros competing here. I'm not sure it was different 20 or 30 years ago. Agassi, Courier, Chang, Sampras were all on the pro track and many a Kalamazoo player now remembers fondly a loss to them. Pros have been specifically allowed to compete at Kalamazoo for well over a decade. A couple wild cards in the KZoo seeding process will be what you do with Wiersholm, who doesn't technically have the ITA Top 100 designation but is clearly a seed-worthy player and whether Uspensky and Opelka get in the ATP Top 1000 by the cutoff time. Probably not given that the cutoff will happen before they could post another result but they are so close. For Uspensky, could be the difference between getting seeded as high as #7 to not at all given his lack of ITF or USTA ranking. The #10 endorsed boy from whatever section still has the backdraw and blueberries and cream to look forward to. Meaning, it is a cool experience to go regardless, although winning is always better, just can't be that way for 50% of them after the first round. This is about the best, there are plenty of other events to impress coaches and besides, they are a lot of interested coaches there watching the first rounds and backdraw rounds. Some of the coaches from the very top ranked schools don't show up till the later rounds, but coaches looking at a kid that is 10th in his section are generally there early. Thanks Collete. I agree with both of you they should compete. I vaguely recall that the great ones you mentioned were still playing junior tourneys possibly even in their section when they played Kalamazoo - as I played the event a few times a year or two before they did. But since pros are allowed to compete for some time, which clears things up, I agree with both of you. Thanks again. Blanch didn't enter. There have been new instructions for seeding which center on UTR rather than the previous criteria. I have always loved your posts and your honesty in your predictions, etc. I have a few thoughts, more thinking out loud…. I really hope Henrik Weirsholm he seeded in the 9-16 slot, at the lowest. He should be in the 5-8 seeding slot if you are going on strictly ability but I understand the seeding selection process. There will be at least 2 Top 8 seeds losing before the quarterfinals with the depth of this draw. Another player, if healthy, who should be seeded is Jake DeVine. He is a VERY dangerous floater!! Even Kumar is a floater in the 17-32 range. The Top 8 seeds better be ready early in the tournament! Somehow & Someway, we need to recreate this tournament 3 more times throughout the year as this will help American Tennis in a Big way. same as recently, I believe, with community access providing coverage of 1 of 3 show court matches which is streamed via a link on ustaboys.com.